The Insecure Writers Support Group is sponsored by alex J Cauvenaugh who has probably culled me from his last as I am two days late with this post. 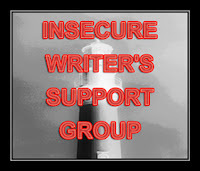 ISwg is a time for us to come together and be open about our writerly woes. Woe #1: Im writing this post from my phone as I wait to go do physical labor for a day job that is supposed to be no part physical. Thus the lack of time lately and being two days late with the post. Woe 2: My current day job allows for no writing time. A point probably made obvios by woe 1. And woe 3 I shall save for another post. It probably deserves more eloquence than I have the mental capacity for right now. I got the link to your page off Alex Cavanaugh, so you haven't been culled yet, at least. And... I have the IWSG down as being on the 7th this month. Sounds like your life has been hectic. I hope things get better in a hurry! IWSG is on Wednesdays, isn't it? As for your lack of writing time--- you should get the book The Eight Minute Writing Habit by Monica Leonelle, lots of good advice for fitting writing in when you have absolutely no time to write. Hope some writing time gets freed up for you soon. I hate when things are that busy, but like Nissa said, where there's a will there's a way... five minutes' writing a day is better than nothing!